An effect of pursuing liberal arts is that one’s mind is no more disengaged with the heart. (yes, that typical problem with modern education). Pursuit of any form of art or art itself as an experience, as a conscious consumption works as a bridge between the left and the right brained orientations that psychology talks about. Bridging of these two sides has interesting consequences in life, which are at times thoroughly satisfying. For instance, one’s conception of music as an experience. Why do eyes well up listening to some people play music? Never knowing who the violinist in Song from a Secret Garden is, but riding with that song a full five hundred kilometers on the road stopping, crying, gazing into stunning landscapes, letting the tears get absorbed by the balaclava covering your face and repeating it all in that order? And so with Ustad Bismillah Khan whose shehnai can reach such depths within that you’ve never fathomed. This affectionate, intimate connect with the person without having seen him ever, tells something about the ability of music to be a language transcending the need to know. You’ve heard a music and felt something happening within? Then you’ve already known him, met him and you are already talking to him. 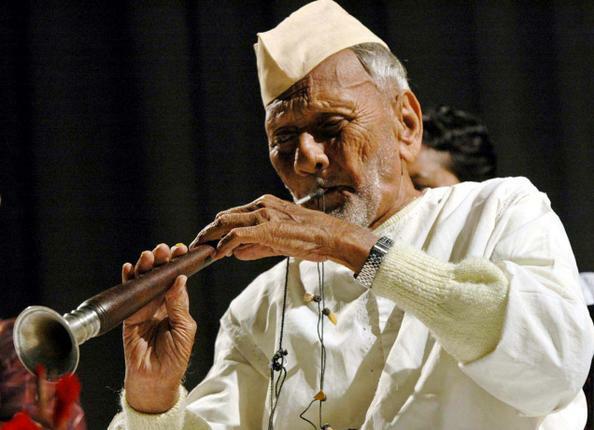 Ustad Bismillah Khan of one’s mind is perhaps the real Ustad Bismillah who he ever wished to be! And the rest is just a body, a physical being as the Hindu belief goes. The affinities run deep and gets deeper with time. That the body is gone? How does it matter? As they say, the music lives on. The language too remains, the message expressed and the man still alive. If you care enough to talk and listen and dialogue, he is there! And so are many such people who are no more with us. I completed a 45 odd day long mad run across the country few days ago. This post resonates what went through on that run. I was overwhelmed, overjoyed, exuberant, sometimes outright sad. Travel when done with music helps me experience my immediate surrounding much more than I would do when I am not listening to music but the rambling of my uncontrolable mind. Music helps me connect to the NOW. About my connection with the artist, I have never wanted to know who is the artisit that has created or is playing the music. I pick up whic ever music I can connect with. For me it has been mostly music that originated from South East Asia and some classical english music. Also this post reminds me to write down about the time spent #ontheroad, ofcourse with a lot of music in the air…. no no.. in my ear!